Elijah Wheat Showroom is an artist-run space founded in 2015. It also serves as a nomadic curatorial experience. Based in Brooklyn, NY and comprised of Carolina Wheat-Nielsen and Liz Nielsen, two artists and curators that previously ran the Swimming Pool Project Space in Chicago. The gallery is named after their late son, Elijah, who passed away tragically at the age of 16. His creative insight, righteous vision and stylistic voice for trendsetting compose the spirit that the gallery honors. As a commercial gallery, they’ve been curating monthly exhibits presenting artists that are underrepresented in the art world. Voices embodied at EWS are socially conscientious, politically engaged and reflective of a creative community striving to cultivate interactions and instigate critical conversations to promote visual art’s accessibility. Clive Murphy, Random Composition Generator, May 19–June 24, 2018. Hi Liz and Carolina! Can you tell us the story behind Elijah Wheat Showroom and how it began? at the Swimming Pool Project Space and that someone she knew had a space in Bushwick and he wanted it to be an art space instead of a corporate and vanilla mobile phone store. We quickly visited it, crunched some numbers, and signed a sublease for a few intermittent months: score! We were just pulling ourselves together financially after quitting our day jobs that moved us to Brooklyn in the first place. It was an incredible gift and serendipitous experience to have been introduced to our incredibly magnanimous landlord and the space. We feel as if an ‘angel’ brought it to us and we are thankful everyday. Me Maybe’ by ear on his violin. He would busk regularly for quick cash and you can still find video of him getting harassed by cops in the subway on YouTube. He would make his fingers dance with a dizzying rhythm and psychedelic finesse to put you into a tranquil trance no matter what state you’re in. He was, like all of us, unique. We regret that he took his own life on January 17, 2014 at the handsome age of 16, however, we are so grateful that we knew him. When asked, “Would you rather know (despite the circumstances), or never know?” We rejoice and holler, “Yes, we are so glad we know!” We give the gift of this ghost, our son, our connection to the aether to the community and hope it brings the love, voice, and unconditional acceptance that he gave to his own friends. Can you talk a bit about the logistics and challenges of finding the space, renovating, and putting on your first show? ‘Logistics’ is our middle name. It’s been about four years we’ve been living in the gig economy, or more accurately, hoping to sell Liz’s artwork and survive in NYC on that cash alone. We do not have formal backers, yet we have many friends that support the gallery by purchasing art here and there. Now, almost three years in the space solidly, we continue to appreciate our little brick and mortar at 1196 Myrtle Ave. We’ve updated some track lighting and fervently patched, sanded and painted the walls between every show (typically 4–6 week turnaround). The cycles of the exhibitions are standardly easy, however, we strive for a professional, museum quality presentation and take caring for our space and each exhibition’s installation very seriously. a summer group show called Hot Slice at Zolla/Lieberman gallery in Chicago. We gathered artists working in NYC and showed a smattering of innovative works in reference to the challenges of making and affording work in a triangle of geographic studio spaces in overpriced NYC. 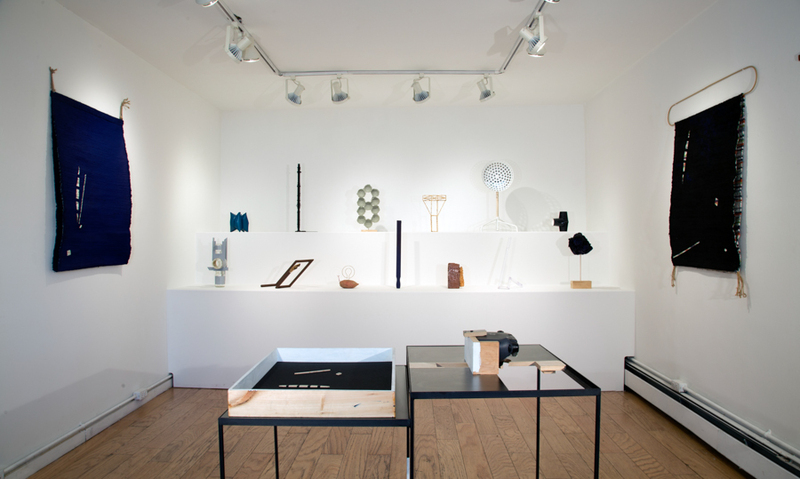 Many of the pieces shown had recycled materials or a presence of found objects: found film, found sound, found light, and certainly related to trends in making at the time. We asked most of the included artists out of the blue, (via finding their emails on their websites) and they have since become friends of the gallery. Our first show in the space was entitled Abracadabra, meaning “As I speak, I create” and we felt that since the space dropped into our warmly-receiving laps that we wanted to imply the magical power of presenting artists in a dream setting in the heart of our community in Bushwick. We chose three female artists, all of whom had known and met Elijah in different iterations of his short life. We celebrated his mysterious creativity and brought works that had a magical and otherworldly quality. What drew you to starting a gallery, and what keeps you invested in curating shows? a group show which is always exciting because as curators, we can put together work that sparks critical connections of thought and new conversations are born. What is one thing that sets Elijah Wheat Showroom apart from other spaces in New York City? EWS has a particular grit to its mission that includes a playfulness to help move through a collective sorrow, or societal trauma and pain as we highlight political ideas. Its location is also unique. It is on a very busy street and many people walk past the storefront and then circle back and come in. We are across the street from a couple of busy, hip bars and a coffee joint so we get many visitors that have just spotted us from the other side of the street and curiosity led them through the front door. We like to call our Showroom window (incidentally, we had already settled on the name: Elijah Wheat Showroom opposed to ‘Projects’, ‘Gallery’ or other iterations before we had our beautiful window!) ‘the portal to the sidewalk gallery’. It brings a diverse community of newcomers, long term residents and tourists to our exhibitions through the window. This, we believe helps us stand out from many of the alternative spaces tucked in the back of industrial buildings and delivering art’s accessibility, just as our mission strives to do. of being based in Brooklyn? in our immediate community. We meet many new faces at every single opening and on a daily basis. What a gift! What are each of your backgrounds and how do they relate to the arts? When did each of you begin curating? Have you operated other spaces in the past? We opened our first artist-run space in Chicago, Swimming Pool Project Space, in July 2008. Liz was looking for a studio and found a 300ish-square-foot storefront space. She envisioned a meeting place to look at art, like a gallery as opposed to a private studio. Thirty-six shows and three years later, we closed it and moved to New York City for a job. After five years, in 2015, we established Elijah Wheat Showroom as a ‘nomadic curatorial experience’ without a permanent space. We like to chat about art, so that year we dreamed up a couple of curatorial experiments and fleshed it out over the year one in Beacon and another at the Knockdown Center in Maspeth, Queens. At the time, July and August, 2016, we had three shows up and running in New York at the same time, phew. We are both artists, Liz works with photography and has developed her own form of ‘Light Painting’ using multiple exposures and making unique analogue photograms. Carolina continues to work with textiles, draws and writes daily, and is currently working on a young adult novel. Our daughter, Acacia, is a natural performer, a vocalist, videographer and plays the piano. What is the experience of collaborating with each other like? What unique strengths do you each bring to the table? We both love interacting with creative people and we both come from a background of education so we share a desire to build our artists up and highlight them in their best light. Mainly, we used to be (and still are!) talent scouts or recruiters for art and design colleges. We work with many emerging artists, so in a way we get to foster and mentor their growth. Curatorially, we respect each other’s voices and allow one another to make important calls without arguing. It seems that we each have things we don’t want to compromise on and we give each other the respect to make certain calls. Sometimes, compromise means 100-percent and 0-percent, we get it. We know what hills to die on, if you will. We seldom argue, really. We typically are attracted both visually and conceptually to the same works, artists and ideas. So, I guess it makes sense that we are in business (and in love) together. Being an artist running an artist-run space means efficiency. We want to do things that we would expect from our own galleries and how they represent our own work. From consignment agreements to sales, we intend to follow the best practices possible. It’s a ‘do unto others, as you would have done for you,’ mentality. Our role stems from integrity, transparency (honesty) and loyalty. but irregular hours. They are usually destination spots where artists gather to support one another and share ideas. In our opinion, some of the most edgy, bold, political, and creative work can be seen in these spaces. The hope is for a sale or two, but the goal is to present what is being made in the studio, when the artist is not at their day-job. a shot, helping fund the production of their work, and helping write about, contextualize, locate the artist as to how and where their art fits into a larger conversation in the art world. Usually, the cash payoff is null, yet the exposure for the artist and the artist-run space can be high cultural capital. Sure, altruism is present, we’re proud of that. We do want what is best for each other, but it is hard when it is at the expense of the little kitten opposed to the mama cat. Artist-run spaces don’t always have the liquid to support themselves (we know there are trust-funded spaces out there, however, that is not our game). It is a passion project and we all work to present artists we believe in with honesty, loyalty, and integrity. the day that one can only have one NYC gallery. The model must change. The art fair scene is over populated and four galleries at one fair can be showing the same artist. Why limit the artist to a geographical location when the global art market often sells to the same one percent, stashing their cash into their ‘investment’. Integrity within the choices that artists make needs to be less about self-serving exposure. Artist-run spaces, artists and larger galleries all mean well, yet we must work together, not against each other. There are some big galleries and critics that are discussing this, however, we haven’t seen the lip service amount to anything, yet. We find artists by having conversations at openings, going to alternative spaces for underground exhibitions, exploring open studios at BFA and MFA programs and cold call at openings of e-conversations with folks’ work we’ve seen at fairs or group exhibitions that we find inspiring. I’ve also made introductions on Instagram. We can’t believe what a powerful tool it has become to discover emerging art (we do worry about the over-saturation, fight for likes and potential theft of intellectual property on the Gram. Mainly, it’s a potentially dangerous tool to rely on.) However, it’s mostly the case that we’ve known the artist previously as a student, colleague, or friend that we once were acquainted with. We were both in college admissions for years (and still are, now branching out to China), so there is that teacher/mentor relationship we harness too. Ultimately, there are many ways we meet and connect with the artists we choose to exhibit. As you can imagine, each is a different story. Taurus Burns, our most current show, is an artist Carolina met in 1992 in Ann Arbor, MI. She reconnected with him on Instagram and watched his progression of painting blighted landscapes in Detroit to his more identity and conceptually-driven canvases relating to the systemic racism in the United States and in our everyday. You co-organized the momentous Nasty Women exhibition in 2017, which became a national and global movement. Can you talk a bit about that experience and your roles in the exhibition and energy surrounding the show? 623 Artists delivered works / 444 Works sold on opening night generating almost $32k for pp / 680(ish) works under $100 sold out generating over $45k / 700+ submissions / 150+ volunteers / 32+ articles written about NWE / 70+ shows now spread worldwide. At once, you have this committed core of individuals, all at the top of their fields, wanting to come together and make something to stand up for our rights and ourselves. We never realized that we would create such an historic spectacle. Roxanne Jackson’s idea blossomed after Jessamyn Fiore found the means to lead production. It was truly grand. As the KDC opened the doors to the event, all ten giant letters spelling ‘Nasty Women’, that Clive Murphy and many volunteers erected, stood completely covered in donated art. The crowds moved in, collectors became activists, and the cash-and-carry system created excitement. lot more about it, it was definitely a team project start to finish. There were so many nice pieces written by a slew of journalists about the event. There are now over seventy venues that have used the fundraising model and have created an incredible network of feminists, striving to allow access to and promote the reproductive rights of all women. We co-curated an The Anti Art Fair October 4–7 with twenty solo booths of artists and a few of the other Nasty Women factions from Portugal, North East UK, Amsterdam and then some. It was an intense experience, however, the feeling of accomplishment is pumping through our veins. able to share 20-percent of our meager proceeds to RAINN, since we were in the UK and disgusted while watching and hearing the Blasey-Ford testimony concerning the appointment of Kavanaugh to SCOTUS, all keeping with the original mission of the Nasty Women Exhibition movement. It is meant to always be a fundraising endeavor, not just a place to show feminist work or work made by women-identifying individuals. What’s up next for EWS? a gallery space in the Marais, Paris and Berlin in the next year. We adore traveling and the creative process of finding new places to install our favorite artworks. be holding down the EWS fort most of the time, while in the process of writing her young adult novel. Otherwise, what’s in store for EWS in 2019 will be more energetic, politically engaged and conversation-instigating programming with solo exhibitions by Alison Kudlow in February, Kathrine Refi in March and two Cuban based photographers in April. Opening on January 12, 2019 there will be a sentimental group show called “Living Room” with Justin Davis Anderson, Aengus Woods, Joel Fennell and Clive Murphy: All incredible men (and close friends) that supported us without reservations, held our base together and grounded our reality, 5 years ago this January when we discovered Elijah dead in our home. Family and friends often carry grief from the departed, and we want to share the location as a comforting place to reflect on life. They will create a space together that addresses: fatherhood, home, and a nurturing and safe quality of a friendly empathetic meeting place.